Let’s talk about where we live. 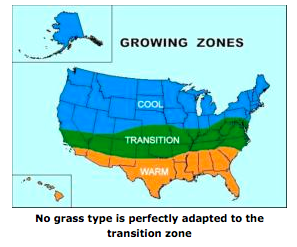 Maintaining a lush and healthy lawn in Saint Louis is very challenging because we are located in "The Transition Zone." This zone is widely recognized as one of the most difficult environments in the world to grow healthy grass. At FixMyTurf.com, we have a team of experienced professionals that specialize in growing grass in this zone. Our goal is to use our experience, knowledge and passion to provide Saint Louisans with lush, healthy and "golf course green" turf. We are committed, dedicated and passionate about providing this for you. This is why we use only the best products and practices on your lawn! If you are interested in improving your lawn, please contact us and we will provide a free lawn diagnosis, as well as tailor a yearly turf care package, that will meet the specific needs of your lawn. Thank you for your time, and we look forward to making your lawn beautiful!